After my recent articles on Backpacking Highlights from Kenya to South Africa on Globotreks, I have had a lot of requests to write about the costs of backpacking Africa. Craig and I backpacked from Kenya to South Africa for 5 months in 2003/04. Africa can be expensive, but it is also incredibly cheap. The cost of day to day living, transport, and accommodation helps to make Africa a budget destination. What gets expensive are the cost of safaris, wildlife viewing, and other adventure activities. You must travel to Africa with a plan of exactly what parks you want to visit, what activities you want to do, and what your daily budget should be. You can blow this really quickly so careful decisions must be made. You will have to give up luxury in some areas in order to be able to do more of the things Africa is famous for. We spent approximately $7,000 over 5 months. This included the very expensive gorilla trekking in Uganda, white water rafting the Nile, and safaris in the Masai Mara, Kruger National Park, Addo Elephant Park, and Etosha National Park. So if you work this out, we spent around $50 a day for 2 people, including everything. From my research on prices currently, it does not look like daily costs have gone up too much. The following is just a general overview, I will be writing follow up posts with further information on each section below, including detailed information on each safari park. Want to know how we reduced our backpacking Africa costs? We camped almost the whole way. All you need is a lightweight tent, a sleeping mat, and a sleeping bag/sheet. Our nightly costs ranged from $1 to $5 a night. You’ll find most backpackers and hostels have areas set aside for campers, so you still get full use of the backpacker facilities, but at budget prices. We camped at our favourite backpackers, Mayoaka Village ,on a terraced garden at the edge of Lake Malawi for two weeks for only $1 a night. It is now $5 a night. You will now pay up to about $10 a night to camp in most African destinations. Hostels in Africa have been my favourite backpackers to stay in. They are clean, staff are friendly, and there are usually a lot of activities going on- many free- that you can participate in with other backpackers. 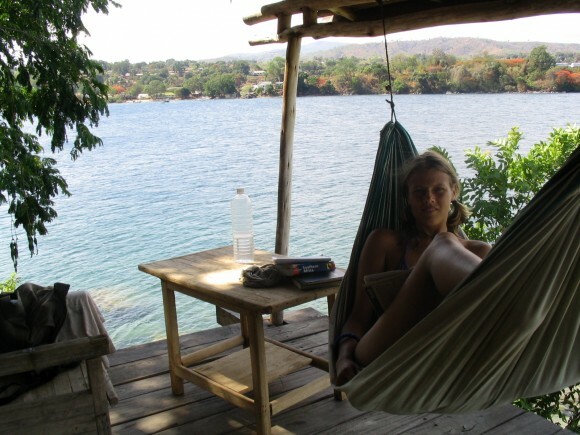 Check out our favourite budget African backpackers. The costs of a backpackers increase in the larger cities and more expensive countries of South Africa and Namibia. Prices range from $6- $20 for a dorm bed and $12- $60 for a private room. 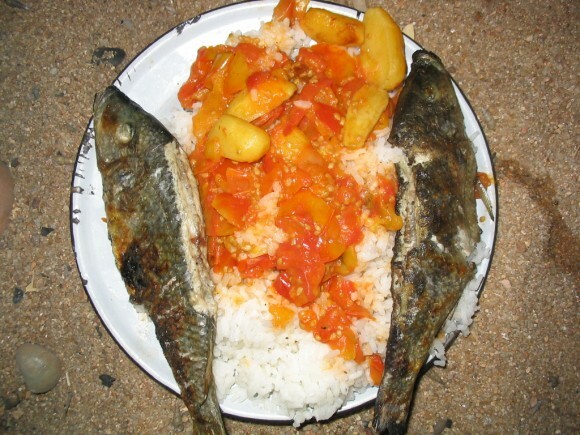 Food choices for budget travel in Africa rarely differ from budget food choices backpacking in any country. It will be cheaper if you eat with the locals or cook food yourself. Most African hostels and backpackers will have kitchen facilities, and markets and supermarkets provide cheap food options. We carried around two plastic bowls and spoons, a packet of cereal and powdered milk. This was our cheap breakfast every morning. 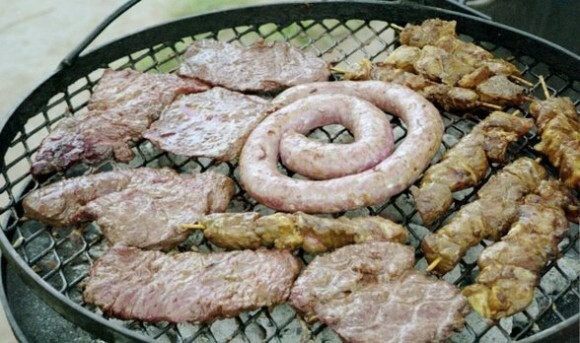 Camping facilities usually have fire circles, so braais or barbecues are easy to do and cheap. Venture out of your hostels and into the local towns, for some cheap food in the local restaurants. Africa is a poor continent so you will find their diet is very staple and bland. Everyday in Malawi we would walk into town for some rice with a basic curry tomato sauce. It was less than a $1 and quite tasty. Hostels usually have restaurants where you can purchase food. It will be a little more expensive, but can be a nice break. Look out for drink specials as well. Be warned that if you order fries you could be waiting hours for it, particularly in Uganda where they don’t have the proper cooking facilities for it. If you can, camp under a mango tree, so they can drop on your tent all day for free food–and delicious too. We also carried a water filter around with us to reduce the cost of bottled water. Africa is hot, you drink a lot, and this can really add up to dent your budget. Travel in Africa is really cheap. But it comes at a different sort of price–it’s uncomfortable and sometimes dangerous. Put it this way, you’ll get to know your heart and breath a lot better, and maybe have more conversations with those guiding forces from ethereal lands. In each town, local min-vans will zip you to wherever you want to go from anywhere from 20cents to a couple of bucks. Mini-vans, otherwise known as matutus, or pick up trucks can also take you on longer distances between towns for a couple of bucks more. Buses will cost anywhere from $3-$32 depending on distances. Train journeys although infrequent are more comfortable and safer. A second or first class sleeper is the best way to travel and fares are usually around $20-$30. In South Africa, taking the on-off Baz bus, made especially for travellers is a comfortable and luxurious form of travel (after 4 months of pick ups it’s heaven). Tickets start from $175 and are quite flexible in their itineraries for taking you to the main backpacker areas. You are going to need careful planning for your safaris. They can get really expensive and you have to be selective about which parks you go to. We wanted to go to everyone but it is just not possible. Do your research. You can read more about our African safari tips. You really only need 2-3 days max in the parks. It can get very tiring looking for the animals. 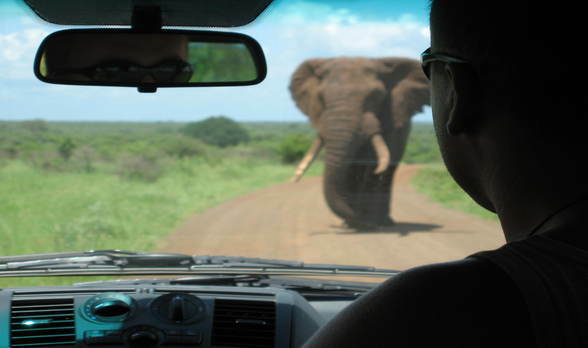 You have to weigh up the costs of doing a safari with your own hire car, or on a guided tour. It is usually best to book the tour when you arrive in the nearest town to the park. 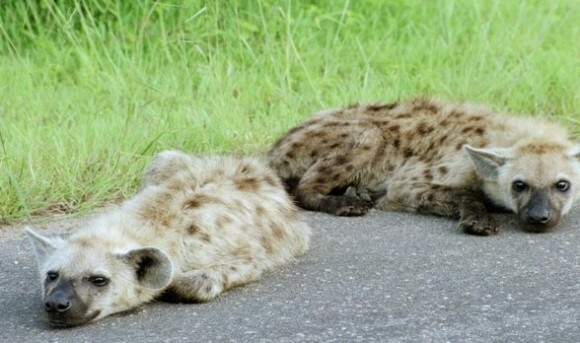 We only went on a guided tour for the Masai Mara, all the rest we hired cars for. 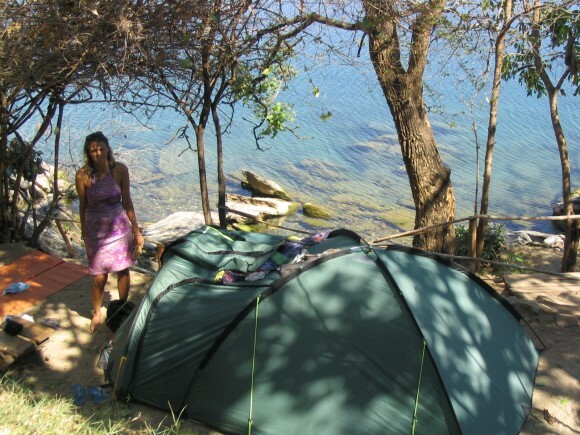 3 day camping budget safari tours of the Masai go for about $400 pp all inclusive. This would be a better option in Kenya as car hire is not as easy as it is in South Africa and Namibia. Costs for guided safaris in South Africa for the game parks are a lot more. Car hire is cheaper. You can hire cars for as little as $30 in South Africa, in other areas from about $75- $100 a day. When you work out the costs of car hire (watch for extra mileage charges), fuel, accommodation and food, it usually works out to be cheaper, more practical and flexible to do it yourself. To reduce the cost of the expensive car hire, we camped at the designated campsites and cooked our own meals around the campfire. We do recommend allowing for extra costs such as guided night drive or walking safari. Limit this to just once, in one park. Allow for around $300- $400 for a 3-day do-it-yourself safari. The more people you can travel with the less that will work out individually. If you are on your own, then a tour might just be easier. Consider hiring a car for a longer period of time and fitting in other activities as well. We hired a car for a week to drive along the beautiful Garden Route in South Africa, taking in Addo Elephant park at the same time. Didn’t Craig and I get off lightly for this one? Right time, right place. It cost us $250 each for the licence to trek for gorillas in Uganda and then it cost about another $20 each to get there (which is a lot for African travel). My brother did the trek in August for $600 each and it is soon to go up to $750. This is only for an hour. You can take comfort in the fact that a lot of this money goes to gorilla conservation. It is a once in a lifetime opportunity. Plan for it and make room for it in your budget. Camping is looking more attractive now, right? To stretch your money out and make up for the expensive safari days, there will be plenty of down days where you are only spending money on accommodation and food. You can get away with doing this for as little as $10, depending on your choices. These are some of your best days. Spend them exploring local villages, visiting markets, hiking mountains, lazing at beaches, and relaxing on the edge of lakes. Is Budget Travel all that Matters? Very good tips for how to travel Africa cheaply. The sights make every dollar spent well worthwhile. You can’t put a price on memories. And Africa is full of them! Yeah. We organized a small tour from Nairobi. I think there was 5 of us on the tour, and our guide was really knowledgeable. We had a great time. I think it was worth seeing the gorillas, especially now looking back at it. It was a difficult decision because you knew just how many days that one hour could give you in Africa. Now that it is triple the price I might think about it more. It depends on what you really want to do. If it is an experience that you have always been dying to do then I think you should do it, so you have no regrets. But if you are so so about it then I’d miss it and spend that money elsewhere. It is only an hour that you sit with them for, it is a challenge to get to, it is hard to see them at times in the foliage, and difficult to take good photos, but still it’s hard to beat a memory of a silverback charging you in the wild- priceless! Great information on Africa! I’m really surprised at how cheap accommodations, food, and transportation is there. You definitely did it the right way and this is a great overview on traveling on a budget! Each country differs with prices, but generally it is really cheap to travel. Even South Africa, the most expensive of the East and South Africa region is still pretty cheap. Some wonderful tips here. I often forget about Africa in my travel daydreams (Asia and Europe occupy it most of the time), but it’s a dream of mine to see as much of Africa as I can. I’ll bookmark this for when I do. Did you do a lot of land border crossing when you were there? We’re thinking of going from Namibia to Egypt on mostly land — whether or not it’s possible/doable within our budget, we’re still researching into it. We land border crossed the whole time. It all went through super smooth. Just check to be sure you don’t need visas arranged before hand. I don’t think we did. We could get them all at the border, and the crossings were just cheap mini van rides across. There are some countries that have expensive visas so be wary of that. I think once you start going above Kenya it gets a little more tricky. We originally wanted to go to Morrocco before Kenya and fly across but we couldn’t get flights as there were no fly zones all around Libya. I think Planet D would know a lot more about this as they biked from Cairo down to South Africa. What an awesome trip! Great experiences and wonderfully affordable. Nice pics — love the one at Lake Malawi. I love these budgeting posts, they probably provide some of the most useful information on our travel blogs. I’m still dead jealous about the mountain gorilla treking though. 😉 Great stuff guys and thank you! Thanks Andrew. Glad you found it useful. The gorilla trekking was amazing. We did a very similar trip and found these tips to be spot on. Traveling on your own through Africa is an incredibly rewarding experience and much more do-able than most people think. You did a great job of illuminating this. Guys, this is the best guide to costs in Africa I’ve seen. I’ve mentioned to you previously that we’re going to do a tour because my boyfriend is not too comfortable with the thought of travelling independently through Africa, but it’s hard to swallow when I see that the cost for two of us for 24 days is roughly the cost of the what the two of you spent in 5 months!! May need to do a bit more persuading on this one… Thanks for sharing!! Wonderful! So glad this has put things into perspective for you. The tours, although will still be great, are expensive. In the end, that was one of our major reasons we went independently. We knew we could do far more and for longer on our own with less money. Safety was the only thing pushing us to the tour, but in the end we had no problems at all in Africa, and we did everything local style. Great info…thank you! Sounds very affordable and hostels and camping seem to be the way to go. I LOVE African food so would be right at home there. Africa has just moved up several rungs on my wish ladder. Hey guys, well done on a very informative and accurate post. We’ve travelled all over Southern Africa, though we have a 4×4 so it’s a little different. That is on our list of things to do next. This would be the ultimate way to see Africa. How did you find the price of the vehicle and fuel? this is SO helpful caz! as you can tell from my other comments on your africa-related posts 😉 i really want to go! great that you followed up on current prices and conveyed that info here. question- did you see many solo women travelers there then? think it would be safe for a solo woman to camp? Actually we didn’t really see a lot of solo travellers. 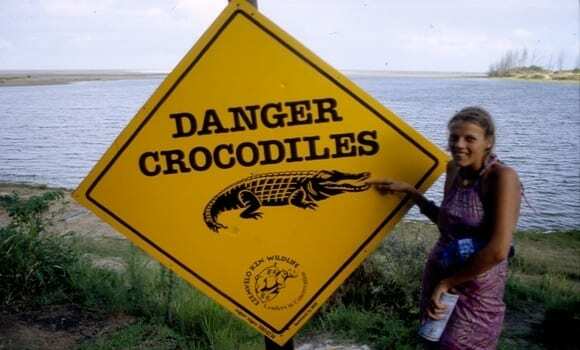 We did meet one in Tanzania, she had a little trouble, but i can’t say she was making smart choices. We mostly met couples or friends travelling together. I still think it would be okay for a solo traveller. You would have to be extra cautious. If you camp at the hostels you should be fine. And if there are any areas you are a bit concerned about then sleep in a hostel room for a couple of nights instead. I guess I would probably be concerned camping as a solo woman, but I think I would feel that way no matter what country I was in. Very thorough – anyone planning a similar trip should be reading this. The expense in Africa shocked me also. I found it to be exactly as you put it here. 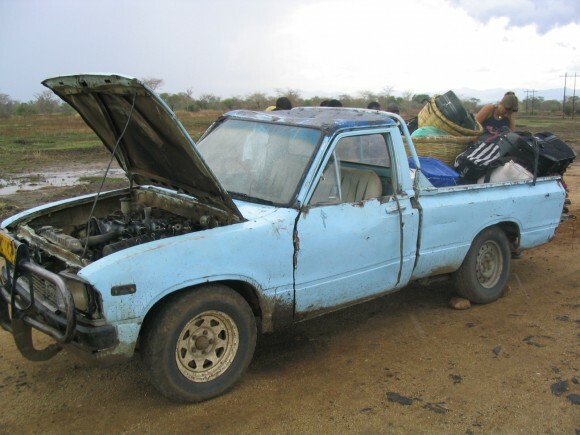 Africa is really cheap…. unless you want to do anything. And unlike other places in the world, most of the stuff you want to do in Africa, you are going to have to directly pay for. You can cruise around and take pics of colonial cities in South America, or pay a little bit for a 5 day pass to Ankor Wat and bike around, or such…. but in Africa, all the stuff you want to do is going to be more expensive. Safaris. Kili. White Water rafting the Nile. Love this continent, but people need to plan to spend a good bit more money than their preconceived notions. I had no idea it would be so affordable, things are looking up for me! I am really looking forward to reading more about you and Craig’s time in Africa! This is absolutely on my list but may be the things furthest in the future (as if we could plan anything the way we want hahaa). This will be a great inspiration to get me thinking about it more! As long as you are thinking about it, it’s moving you closer to getting there. I am going to aim to have one post up a week now about Africa, until I run out of things to talk about. The difficult thing is most of our photos are on slide film, so I have to scan them over to digital. It’s a task and they don’t scan up as great as what they look on slide. Wow, awesome post with so much helpful information. We only contemplated Africa when planning our RTW and just figured it was too expensive for that trip and that we’d do it at some later point. This has me wanting to call Megan right now and tell her to quit her job so we can go next week. Obviously you have to sacrifice in order to be able to do it on the cheap, but your suggestions are fantastic. I know who I’m going to when we inevitably plan our Africa trip. Maybe we can have a S. America/Africa pow wow at TBEX in June? Caz, Craig – thank you for all the wonderful information on Africa. It helps ease my anxiety a bit about traveling around the continent (solo.) Question regarding camping: would you recommend bringind a tent/ sleeping pad from home or are there opportunities to get those items in Africa should I change my mind and want to go that route? I spent 2 1/2 months traveling through Turkey with my tent but only used it once. It was a bit of a pain to say the least. It appears camping at hostels is becoming almost as costly (or more) as staying in a dorm. Does anyone else have more recent cost comparisons? Hi, this is such an amazing blog!!! Just wondering who did you do the Kenya Safari with – trying to find a budget tour company for next year when my husband and I start travelling. This blog is amazing,its very expensive in South Africa. It appears camping at hostels is becoming almost as costly (or more) as staying in a dorm. I have traveled to Africa many times. I do enjoy taking it on the more independent side. biking, hiking, boating through SA is very fun, plus you get great photo opportunities in the more secluded areas. I say to everyone you have to try out SA in your lifetime. http://africanphotosafaris.org – I always have traveled with this safari company their really helpful, fun, safe, and will take you on a great adventure. I really love your blog and especially this post! I’m just about to turn 18 and I’ve got a solo trip from South Africa to Kenya planned from December-March(ish)so this was really helpful and inspiring. Thanks heaps, your amazaing! Me and 3 other friends (all girls) are planning on a 3 month camping africa trip. People keep telling us we are crazy and it will be dangerous but i beg to differ. Any tips for places like Namibia, Botswana, Malawi, mozambique and kenya camping wise? There are plenty of campsites around, A lot of hostels have gardens for camping. Any guide book will be able to direct you to a campsite. Our fave was Mayoka village in Nkhata Bay Malawi. They had a terraced garden campsite right near the lake. I just came across your blog and thought I’d drop yu a note. My wife and I lived in Africa for 4 years with the Peace Corps (Cameroon, Guinea, and Zambia) and we also travelled on a very low budget while there. Unfortunately South Africa and Namibia have become much more expensive than years past. Where camp grounds use to cost $15 in the national parks and $5/pax at hostels, they now charge around $22-35 in the NPs and game reserves and about $10/$12 at hostels!! Very disappointing as we were about to spend this summer in RSA. And with the cost of gas now…forget it! Hi Caz, love reading this about Africa. I’m taking my 16 yr old daughter next year around June on a father daughter backpacking trek, we want to spend a week at least helping in an orphanage and in total 4 to 5 weeks backpacking .my question is coming from Australia where should we start, say at cape town or up in Kenya . Sounds like a wonderful trip Colin. What an amazing bonding experience for you and your daughter. I’m sure she will love sharing this time with you. I don’t think it really matters where you start, but I would say start Kenya and go down. IT’s always nice to finish in Cape Town because it is just so stunning! But before you decide, consider where in AFrica you are planning to go and research online the best time of the year to go. For example if you were going to Etosha, in Namibia you want to make sure you go there when it is the dry season as you have more chances of seeing the animals. I’m guessing over a six week period it shouldn’t really make much of a difference but just check anyway to make sure you don’t miss the best time to be in a certain place because you chose one direction over the other. Enjoy it Colin, it is an amazing continent! 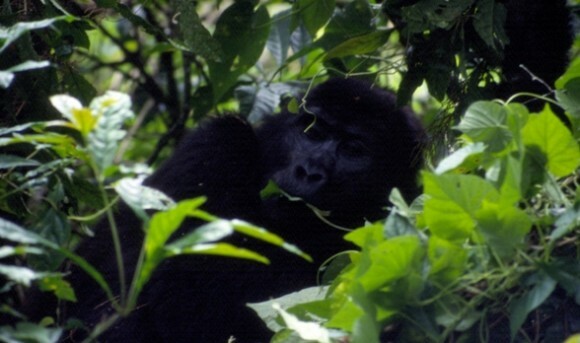 When I did the Gorilla Trek in Uganda in May (I think), 2011, it cost $500 for the license. Those are some pretty steep price hikes. Yep, it is crazy!! My brother did it just before they were yanking it up again to $750. yikes.. that’s a little much.. but the gorilla trek is quite the experience if you can save up your pennies. Great article! Just wondering if you have any tips on making it as light as possible with camping gear? I’ll be doing the trip but we are just two girls and trying to weigh up wether it would be worth the extra weight or not. Thanks! All we carried was a 2 man tent, a lightweight roll sleeping mat and sleeping bags. Most of the time it was too hot to even use them. You can get really lightweight tents and sleeping mats these days. Most of the camping areas in Africa are situated inside hostels, so you have use of the kitchens there, which is awesome as you don’t have to carry cooking gear. For those times when it is not, just use the campfire. We carried cereal with us with powdered milk (not the best, but the easiest. For other meals we either cooked as we went or bought from the local villages- it was cheap enough. I’m the founder and marketing director for AfraVentures, a tour company that emphasizes “voluntourism,” travel with a purpose. Right now our trips are focused in Uganda, but we will set you up and guide your trip anywhere you’d like. If you haven’t found another option, check us out. You won’t find a better price, anywhere, for what we offer. A 30-day trip through us includes safari tours, gorilla tracking, rafting the Nile, nights in the community and nights in some magnificent lodges, and additionally, an opportunity to change lives. We will let you decide what sector of the community you’d like to work in, and go with you to areas that desperately need your help. Something as simple as spending the day with a family, buying them a kilo of sugar or rice or flour, donating a pig or goat, assisting in building a chicken coup or home, teaching in the pigmy schools for the day, talking to moms who need encouragement as they raise their children in a poverty-stricken country, will change their lives forever. We offer a rebate for you to use in whatever area of the community you feel the most touched by. You can return home with a greater sense of purpose, while also feeling recharged and revitalized. I’m in Africa right now as I type this! There’s so much to see and do, so many lives you can change. If you’re interested, check out our website, http://www.afraventures.com. My name is Kristin, give me a call! It was a great read. I am planning to backpack through Africa as well. How did you find hostels and campsites? I cant find any online. did you find campsites in Africa or did you just searched online? We just found them when in Africa. We used the Lonely Planet which was really helpful. The hostels in Africa are some of the best I have ever stayed in. They really are awesome. The campsites are great too. You can camp in many of the hostels which is awesome as you get the cheap flights, but the use of the facilities and the atmosphere of a hostel. Great post. I am planning a trip to Africa later this year. By any chance, did you also climb Mount Kilimanjaro? I am planning for Kenya & Tanzania. Mount Kilimanjaro is really expensive & I am toying with the idea of skipping it. What do you say? Also, any thoughts on Serengeti?? I’m so glad I came across this article, dare I say it has given me invaluably helpful advice! I’m an eighteen year old woman and I’m making a similar 3 month trek from Nairobi to Cape Town in February. I’m backpacking from Dar es Saleem on, but now I’m pondering going on a group tour through Tanzania/Kenya at all due to the high expense that would eat away half of my budget. Would you recommend going it alone given my age or do you think I would be better off starting with an expensive tour? You mentioned you organized a small tour, was that done locally or planned ahead of time? Was it a local tour operator? We organized a tour through the Masai MAra with a local operator when we arrived in Nairobi and was not too expensive. I found the men in Tanzania to be quite aggressive and they push hard for a sale. I think you could travel the country easily on your own, but be very cautious and try to partner up with some other travellers if you can. Great post! It is full of great information! This article is a great read and it is full of useful information. Thank you for those fruitful recommendations! I’m interested to know how you did some things while you were camping; ie how did you cook for yourself? And where did you shower? Did all of the camping spots have bathroom facilities? Lovely article! Just the one I wanted to help me decide to go backpacking through south and east africa. Great tips. Love your spirit. Good luck and many more happy travels to you and your family. Interesting read – for anyone considering backpacking in Uganda, the Uganda Wildlife Authority runs numerous campsites in their National Parks for less than $5 a pitch – just re-search the campsite, some have better facilities then others, make sure you have cooking equipment if you plan on staying in some of the smaller campsites and make sure to bring some fire wood! We are headed to South Africa in 3 days starting in Cape Town and headed up the coast, including Ado Elephant Park. I know you didn’t have kids at the time, we are going to be traveling with our 4 and 6 year old. Any recommendations you can make looking back now that you have kids about budget travel in South Africa? We have a small car rental that we have for 5 weeks which is the duration of our trip. My husband and I will be backpacking in Kenya and Tanzania in February/March 2015. We are having a tough time finding budget accommodations….any recommendations? I tried to open the link you have in your article above on Budget African Backpackers but it seems to be not working! Hi me and my boyfriend are going travelling next year our first stop being South africa , when booking we are being told that it would be better if we get a tour as we are planning to treck from jo’berg to Zanzibar … Is it easier , cheaper and better doing it yourself or will a tour be good ? Good Post and thanks for sharing this useful and informative post with us!!! Awesome tips. Really. My partner and our two kids are heading to East Africa in a couple of months – for a couple of months. In your experience, how easy was it to find a place to camp? We’re ‘local style’ people so this guide was really awesome. Journey to South Africa like a dream come true, last time I had flight Chicago to Cape Town, that was my life wonderful journey. Loving your blog so far. I couldn’t get the link for Budget African Backpackers suggestions to open… mind posting the names of a few? What did you do with your belongings if you were camping? I mean, say you were in a town and went out for the day. We just left it in our tent. We never really travelled with anything worth stealing or valuable, especially in Africa. 2010 was my African adventure which kicked off at Soweto Backpackers (Lebo,s place) where I stayed in a dorm but noticed a section where some people pitched tents. as I was carrying sleeping bag with me.